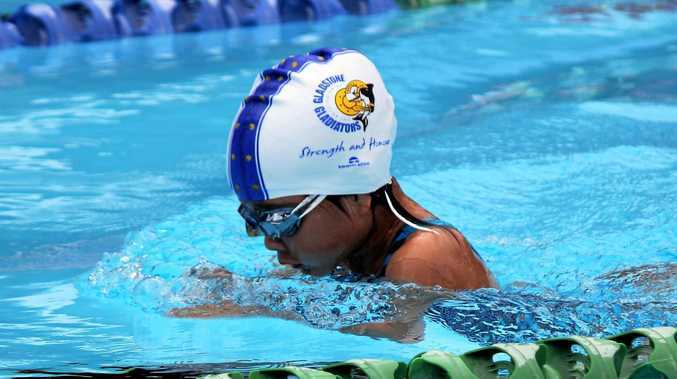 SWIMMING: Gladstone Gladiators' 12-and-under athletes will again test themselves at noon tomorrow. Eighteen swimmers from the club are at the Don Ireland Swimming Complex to compete in the 2018 Summer Skins Spectacular Development Meet in Emu Park. With 238 athletes from 18 clubs from the across the region in attendance. The meet consists of 25m events in each of the four strokes with competitors required to enter in all four to be eligible for the 100m or 200m individual medley. Gladiators head coach Tom Fronek wanted to focus on his juniors at this meet to let his senior swimmers rest and give the younger athletes some more racing experience with all his focus on them and their development. "This is a good little meet to test out their speed and I think they will do well," he said. The fastest six in both 12-and-under and 13-and-over age groups will battle it out in a skins eliminator round in each stroke. Swimmers race 25m in 70 and 60 seconds respectively with the slowest swimmer eliminated each round and the winner to take home the prize-money. Fronek said there is a deep pool of junior talent at the Gladiators. "There is some strength in our juniors and they are showing good form so we should have a little team of champions coming through in the future," he said.